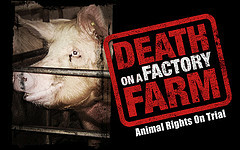 Factory Farming. I don't like it. Most of us vegans and vegetarians don't like it, and I'm sure a majority of meat eaters don't particularly care to watch the happenings that occur at these heinous places. At Vanderbilt I am a double major in Philosophy and Medicine, Health, and Society...so I thought it would be great to combine my love of philosophy with my love of animals and take our Animal Ethics course here at Vandy (taught by my favorite professor yet, Joan Forry). On Monday we watched the film Death On a Factory Farm and for those of you who haven't heard of it or watched it check it out...it's pretty intense, but most of us have already seen some pretty graphic things. Personally, I had a hard time watching some of it but what I really wanted to draw attention to was the fact that the people in these films truly had no remorse for their actions towards the pigs they were killing and beating. One of my biggest concerns with the meat industry is so many humans that work on these farms can be so terrible to other living beings and laugh while doing it. Yes, it makes me mad, but ultimately my strongest emotion I feel is sadness. It hurts my heart to know that there are people capable of injuring and mutilating non-human animals drastic ways, such as beating them with hammers and hanging them alive (these two are both depicted in the documentary). It only makes me wonder what these types of people would do to other fellow humans and what they are simply capable in general. I get bothered watching things like that - usually I'll turn away. I know it happens, but I like to think I'm doing my part where I can. Human beings are capable of so much harm when they think they're doing themselves good -- I think about the richest having more than they need when others are suffering, too. It's great to hear you like Joan - she and I went to school together for a while at Temple. She is pretty awesome. I didn't know she was at Vanderbilt. She's probably my favorite professor I've had here at Vanderbilt she's definitely allowed me to develop my philosophical thought train.